VOCE DI MECHE: SLEIGH BELLS RING, ARE YOU LISTENING? We fell in love with Mahler's Fourth Symphony some years ago when we heard it thrice in one week from the conductor's box at what was then called Avery Fisher Hall. The second we heard the sleigh bells in the introduction, we were drawn into a magical soundscape. We have come to enjoy most of Mahler's symphonies but we find this one the most accessible. Mahler's melodic generosity, his harmonic invention, his lavish orchestration--all conspire to make this turn of the 20th c. symphony a favorite. There is a sunniness to this work, with only occasional lapses into the minor mode. It's the kind of picturesque work that invites visions into the mind's eye. The first movement introduces us to a fairytale world with two lyrically melodic themes in succession, suggestive of the sonata-allegro form. The sleigh bells recur periodically reminding us that we are on a journey. We have no idea what other listeners hear and see but for us there is a peaceful forest where elves and ogres dwell. There is a forest bird portrayed by the piccolo. There is a haunting horn call. There is always the feeling of otherworldliness. The Met Orchestra played brilliantly for the balletic Maestro Michael Tilson Thomas who abandoned his baton, swayed widely on the podium, using his body to extract every nuance of the score. The first three movements, none of them lively, serve to set us up for the fourth movement, a setting of a song from Des Knaben Wunderhorn. Star soprano Pretty Yende produced some gorgeous sound as she sang the strophic verses of the song "Das himmlische Leben"-- a child's view of life in heaven, free of earthly cares. It sounds as if the movement quotes melodies from the first three movements but, in fact, it is the other way 'round. The song was composed first. We thrilled to the sound of Ms. Yende's voice, even when the German got lost in the dense sonorities of the large orchestra. This was also true in her performance of Mozart's Exsultate jubilate, a three movement sacred cantata in Latin, written just before the musical prodigy turned 17. He was inspired by the performance of a castrato named Venanzio Rauzzini with whom he became friends. 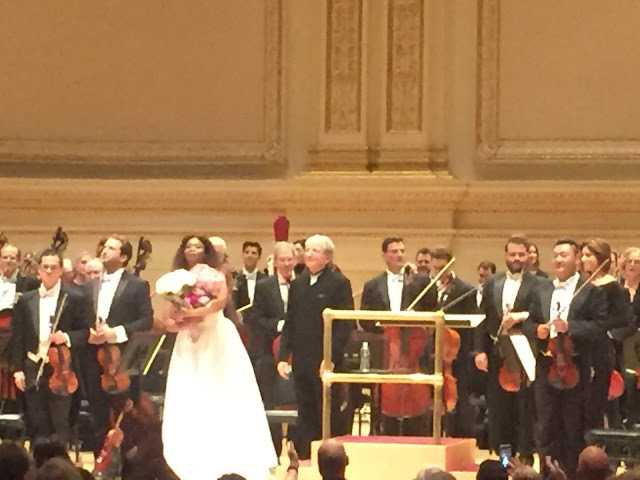 Thankfully, castrati no longer exist and one couldn't have asked for a better sound than the golden voiced Ms. Yende whose golden gown must have been selected to match her voice! If there were a vein of gold to be found in the opening piece, we failed to mine it. Carol Ruggles' mid 20th c. Evocations evoked nothing in us but distaste. We are sure there were more receptive ears in the audience than ours.